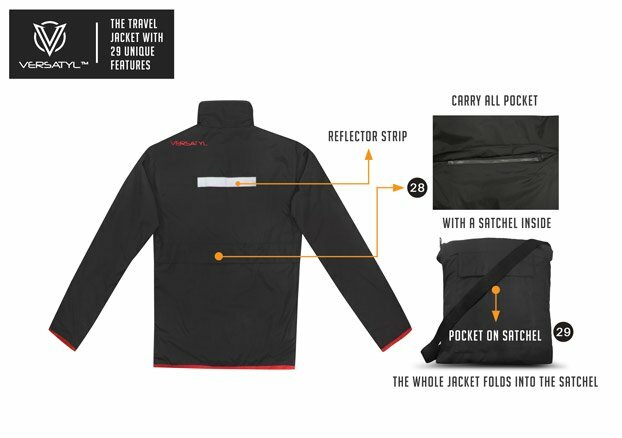 VERSATYL - THE WORLD&apos;S MOST USEFUL TRAVEL JACKET IS BACK! Whether you&apos;re traveling across the world or heading downtown, you should be able to take all of your stuff with you. What if you could carry all your travel needs in a jacket & free up space in your bag? I am an ex-IBM engineer who started a garment manufacturing firm based out of the startup capital of India - Bengaluru (AKA Bangalore). The VERSATYL is uniquely suited for all kinds of travel & will change the way you store your accessories. This jacket combines form with function and is available currently in 4 colors. It has 14 zips and weighs in at just 470 grams. The pockets will store everything from pens to iPads. 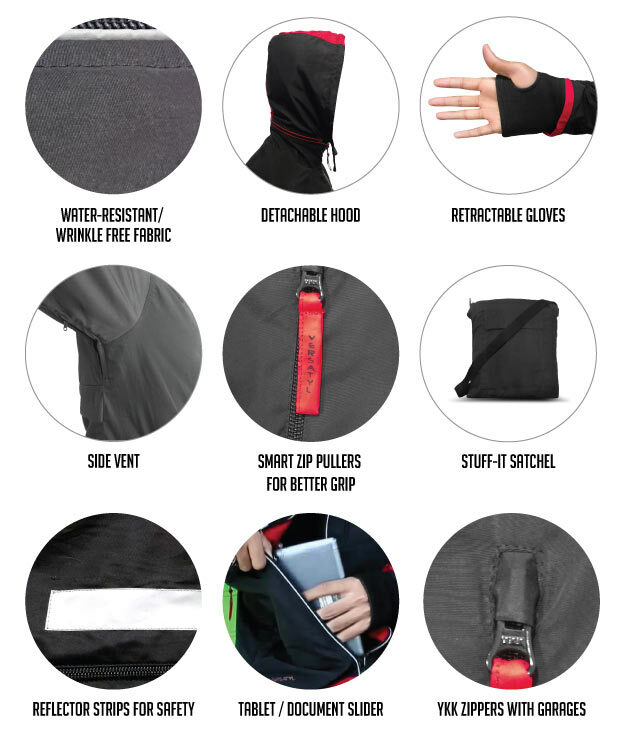 CHECK OUT THE FEATURES THAT MAKE THIS JACKET THE MOST VERSATILE PIECE OF CLOTHING YOU&apos;LL EVER OWN! INSIDE PIC: The Inside of the VERSATYL has another 11 features taking the total to 27 features. 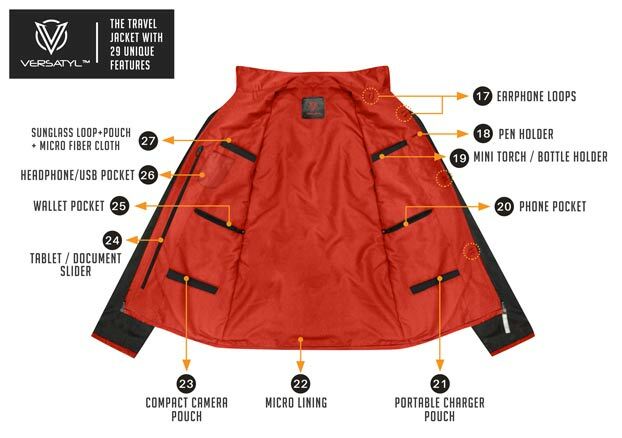 The Jacket has a "carry all" pocket at the back - which means it folds into that pocket and the satchel can be carried around like a sling pouch. The same pocket doubles as a massive storage space when you are wearing the VERSATYL. REAR PIC: The back of the VERSATYL has 2 additional unique features to add to it&apos;s 29 features. The idea for this came when Saneen Javali (who was an engineer at IBM & now one of the Directors and Chief Designer at Emirate Fashions) was looking for something unique to make at a breakthrough price. Most travel jackets he noticed were overpriced and this spurred him to design the VERSATYL. 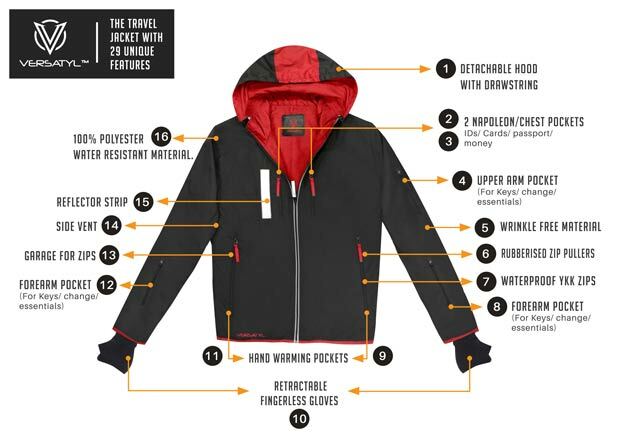 The vision is to make it the de-facto standard in travel jackets. Be it on an aircraft or a boat, on a bike, trekking in the countryside or for everyday use, the Versatyl is what you want. CHOICE OF 4 COLOUR COMBINATIONS! Quantities of jackets indicated in the table above indicate numbers available at each price point. The price you will be charged for international orders will be the INR price. There maybe small changes in the USD price based on currency fluctuations. To pre-order your VERSATYL Jacket, just click on the reward you want. You will be asked to register on Fueladream.com. Then select your size and color preference before you make the payment. Payments can be made by credit/debit cards or with internet banking. 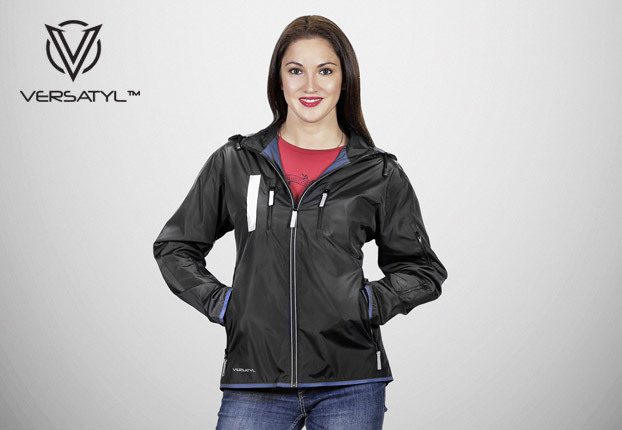 The outer layer material used for this jacket is 100% polyester, oil Cire coated /water resistant & wrinkle free material. The inner layer is also 100% polyester, NS Oil Cire coated. 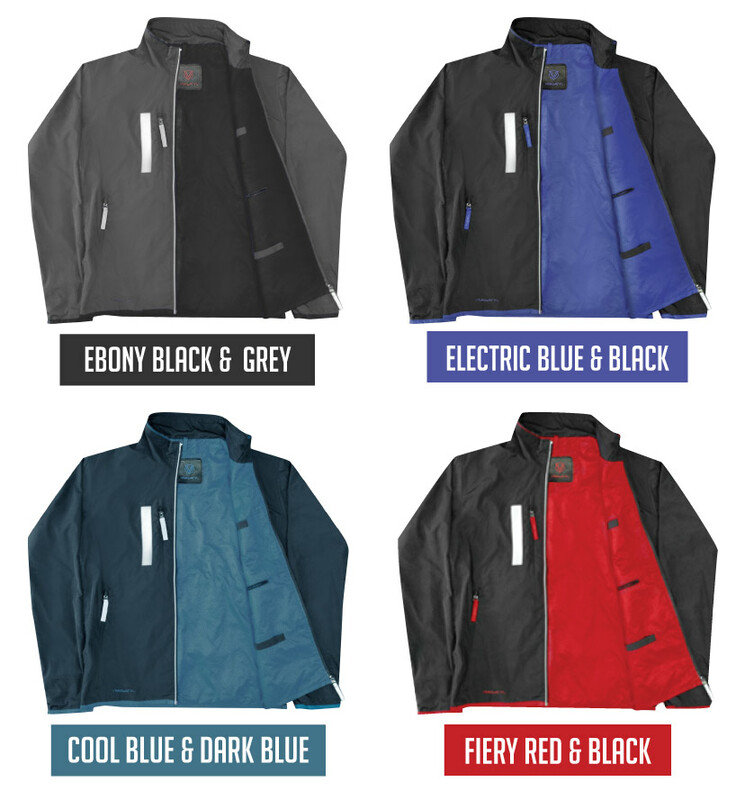 PRE-ORDER TIP: Its best when ordering the VERSATYL jackets to order one size bigger. That is because when you stuff the Jacket with a number of items you will need some extra space for it to fit perfectly. We are a garment production firm & have a trained set of workers & designers. We are aiming to start shipping out Jackets from Mid April 2017. We don&apos;t expect delays as we have already done a crowdfunding campaign and shipped out jackets as per schedule.Acts of god w.r.t inclement weather may be spoilers. For International shipping we plan to use DHL or equivalent courier partners to get the product shipped out. How to pre-order your VERSATYL? Step 3: Select your preferred size and the colour of the VERSATYL before you make your final payment. How is the VERSATYL priced so low? We run a tight ship & have an efficient structure. We have automated machines with high labour productivity. Further. crowdfunding means our INVENTORY & WORKING CAPITAL requirements are almost ZERO as we get funds in advance. That translates into very low costs for us. Rather than try & make big profits we would rather build a big brand. We decided we would pass on most of the benefits of this lower price to you - our funder. We still make a decent profit at these prices! Emirate Fashions Pvt Ltd has a long history in clothing manufacturing and has been making garments for a few of the reputed brands in India. The VERSATYL is the result of massive demand that we&apos;ve seen from observing travellers, bikers, cyclists & the outdoor person. Rather than come up with another Jacket, we decided to give "people on the move" a piece of clothing that gave them the freedom to carry all their essentials around on their person! We&apos;re launching this campaign on fueladream.com to make it easier to reach out to customers globally! Are there any international custom fees? The cost of the Versatyl includes international shipping. However, any duty/taxes/local levies etc. if applicable are not factored for and will be the responsibility of the funder. You will need to pay this when you receive the Jacket. The jacket is water resistant & not waterproof. If exposed to long durations of heavy rainfall, water might begin to seep in through the seams. We do not have a return policy. Since we are crowdfunding it and doing this at a breakthrough price we cannot afford a return policy. Our advice on size is to ideally pick a size that is slightly bigger than what you would usually buy. That is cause when you stuff the Jacket with a number of items you will need some extra space to have a perfect fit. Should I order the Jacket in my size or is "a size bigger" the correct fit for me? Jackets are usually worn on one or two layers of clothing. In addition the VERSATYL can pack quite a lot of travel stuff making it bulk up a bit. The last thing you want is a super tight fit. Ordering a size bigger is what we would recommend. The final call is yours. VERSATYL Campaign ends with a high note! A Big Thank you to all the Funders of the VERSATYL jacket for making this second campaign a huge success. We are really happy and grateful to have ended the campaign on such a high note. This has been an amazing journey for VERSATYL so far. We would like to take this opportunity to let you know that shipping has commenced even before the campaign came to an end. We just have around 50 Jackets to be shipped of the over 750 nos pre-ordered. VERSATYL again becomes a " STAR" campaign on FuelAdream.com! The VERSATYL Crowdfunding campaign has got past 100% of it&apos;s goal and has again becomes a "STAR" campaign on FuelAdream.com ! We are grateful, happy and excited to have reached our goal. This has been an amazing journey for VERSATYL so far. We still have 20 days to go for the campaign. We want to take this opportunity to thank YOU, our funders, for choosing the VERSATYL and crowdfunding it on Fueladream.com. @Sanchit, We received your package yesterday, Its returned, It says door lock. Have you shifted? Kindly give me the new address so that I can ship it. thank you. Transaction ID 610h-nzw8-17rk. Its been two months i haven't got any updates via mail. Also i want to change my shipping address as i have shifted to new place in the same city. Inform me with where can I send you my new address. Hello, I received my jacket today. Thanks for working on this diligently! Happy with the product I received. Thanks again! @Aldrin, Really sorry buddy. The Logistics team took us for a toss in ur case and they were promising me all these days that they would be delivering you but yesterday finally they accepted that they have lost the package. However we are not working with first flight now. Give me one last chance. Today I have shipped your Jacket through IndiaPost and it should reach you in 2-3 days. This is the Tracking detail (EK359732352IN). Status can be checked evening. Thank you. I am yet to receive my jacket or refund.. I am done pleading with your team or the courier company for the jacket.. Please process my refund.. Its been a very frustrating experience.. I now feel I should not have supported this campaign in the first place..
My transaction ID is 548h-b5b8-u7c0, please could you drop me an update on expected delivery? @Sanchit, There was some error in our database and we had lost your details. Apologies for the inconvenience, dispatching your Jacket today. You will be notified. Thank you. Transaction ID 610h-nzw8-17rk. its been almost two months ,order has not been delivered yet. kindly check and update. @Aldrin, Hope now the issue has been resolved. Thnak you. Any update on my order? Transaction id is 253-bhly-bk69. I have lost hope of receiving it.. Its been more than 3 months now.. Can the money be refunded to my account? @Saneen Javali - Just received the jacket today. @Ahmad Nazmi Mohammad, Dispatched today. Tracking details Will be mailed to you by EOD. Thank you. Received it today in the afternoon. Thanks for the promptness man. Its very utilitarian, while beautifully maintaining its minimal aesthetic.. Zips not horribly standing out, branding where it needs to be. I commend you for your confident approach, and your adherence to utility and simplicity over gimmickry. Very happy to see the practical thoughtfulness in product design, and quality standards coming out of our country. Looking forward to your future endeavors. @Aditya, There was some error in our database and we had not captured your details. Hence there was a delay. However your Jacket is being shipped today. Thank you. @Aldrin, The Logistics guys will get in touch with you soon. The Package is stuck somewhere. I have escalated it. Thank you. Hi Saneen, Could you please update me the status of my order with transaction id #rb30-893v-5u67. Also, since it's a referral, will I get the t shirt too? @Vinu Mathew, I have mailed you the details. Status says its delivered. Thank You. Request you to kindly give me a update on the delivery status of transaction ID ud84-2h7e-4p7v. @Dinesh, We were unable to locate your details as there was some error in our sheet but finally got all your details and your Jacket will be shipped tomorrow. Thank you. Eagerly waiting to receive this super kewl jacket. Please check Transaction ID: sl3q-g6rr-4o04 placed on 17/04. thanks. @Ankur Divekar, Your Jacket has been dispatched. It should have been delivered by now. I am in touch with logistics team to escalate this. Thank you. @Akshay. apologies for delay in responding to your query. Your Jacket was shipped out on 15th. It should be delivered to you today. India Post - EK359731003IN . Thank you. I also realized, @Saneen that I never got a confirmation email from Versatylwear, just from fueladream... Does that mean I should forget having asked for a bag in return for contributing towards your campaign or can I still expect to get a followup or a call from you? Do the right thing, buddy, come on. Transaction ID : 169b-5e4c-1683 This is the THIRD time I am posting, with no reply twice. If the shipping is delayed, its ok.. but atleast give me an update about it ?? @Nitin, I am mailing you the status of the parcel. plz check the attachment. It says door locked. I am asking them to reattempt. Thank you. Hello Saneen, I was told 5 days ago that Jacket is ready to ship, but I haven't got any mail/msg regarding tracking number. My Transaction ID: a5iq-j27e-kbb4 Please update the status on same. thanks. @Kunal, Your package is in transit, Status says its in Rudrapur now. Delivery might happen in 2 days. India post, EK359730921IN. Thank you. Transaction ID: xi1v-qd79-p09x. You've started a new campaign and I see several shipments of fellow contributors still pending. Kindly get back ASAP. 2wxk-030g-1vt9 is my transaction id. I was told that my jacket would be shipped by this Monday.. But it didn't happen and I didn't receive any update on the same yet. Kindly, let me know the status. @Sridharachary S, Your Jacket is packed and will be picked up today by india Post. Tracking number - EK359730816IN. status can be checked tomorrow morning. Thank you. Tnx ID : 7x0w-2a1z-n587. I have dropped a mail and got a reply saying that the jacket will be shipped in 10 days but its been a month and i didn't get the jacket yet. Could you please tell me when i can get the jacket? @Nitin, Your Jacket is ready to be shipped today. You will be notified on shipping. Thank you. @Saket, Your Jacket will be shipped tomorrow. You will be notified.Thank you. Transaction ID: a5iq-j27e-kbb4 Please update me on the status of delivery. It's been a really long time since I have placed the order. 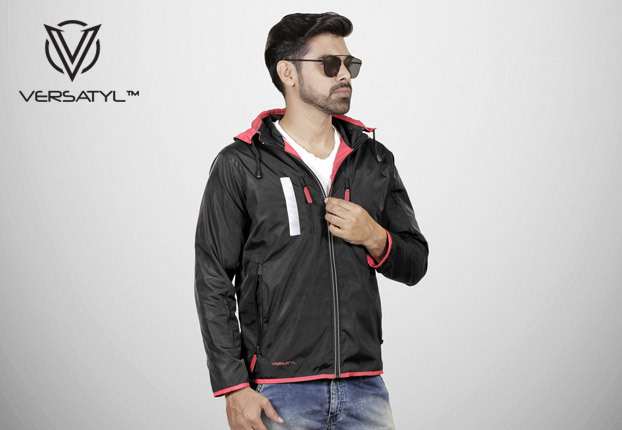 @Kunal Singhani, Your Jacket will be shipped by Monday. you will be notified. Thank you. @Jamie, As discussed on Chat, Your Jacket is being shipped today. Thank you. 2wxk-030g-1vt9 is my transaction id. Kindly, update me on the status of delivery. It's been a really long time since I have placed the order. @Sanchit Tripattiwar, Vinu Mathew. Your Jackets will be shipped by monday. You will be notified. thank you. @Aldrin Sneham, your Jacket is in Transit, have escalated for faster delivery. thank you. Just received the jackets. Its a wonderful idea, so much of space to keep so many things together, hats-off to the team for making such a brilliant product. cheers! Hi Saneen. 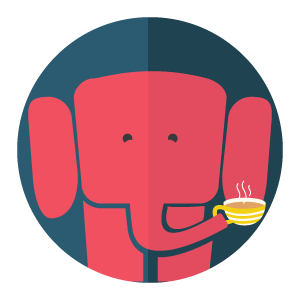 Request you to kindly give the delivery details/ status of the transaction ID ud84-2h7e-4p7v. @Jeswin Rajan, Your Jacket was shipped yesterday, Tracking details will be mailed to you today. Thank you. @Naveen Kumar AB, The status of your dispatched jacket has been mailed to you. kindly check. Thank you. Please provide the tracking details for this order 7s2k-113n-5cul . May I know when it will be delivered? @Manjunath Shriram, Your Jacket was shipped yesterday, Tracking details has been mailed to you. Thank you. i644-9w68-39c5 is my order number. May I know when it will be delivered?? May I know the status?? @Funders, All the remaining orders will be shipped within 5th of May. Thank you. Please provide the tracking details for this order, 0m61-c5dz-sevr. i644-9w68-39c5 is my order number. May I know when it will be delivered?? @Saneen Javali - The email was sent to the mentioned email ids. XXL, Ebony Black. @Ajay, It is in Transit. Status has been mailed to you. thank you. Hi Saneen, I still did not receive the product. 60gp-kqph-vd78. @Ayush Jain, Dispatch date is 27th of april. Tracking details has been mailed to you. Thank you. @Nimesh Sharma, Status has been mailed to you. Kindly check. Thank you. Hi Saneen. It's been more than 2 weeks and I haven't recieved any updates even though I stay in Bangalore. Could you please help. My txn ID is b564-93k7-p4h4. @R Goutham Gupta, Thank you very much for the feedback mate. We are happy that you loved our product. Thanks again. @Harpreet Singh, Your Jacket was shipped yesterday. You will soon receive tracking details on mail. Thank you. Hello Saneen - y9i7-ju54-97uv Its been a week, no update on shipping. Please help. Awesome concept !!!! Great product ....Well done team.. I ordered this jacket on Sunday night and got it delivered 5 mins back, which is pretty fast I would say. Maybe being in Bangalore helped. I just checked the fit and various pockets and I am pretty happy with it yet. However, I feel the quality of chains could be improved a little bit. For the Early bird offer, its a very good deal in my opinion. @Soumye, Your Jacket was dispatched on 25th of April. you should be receiving it in 3-4 days. Tracking details has been mailed to you. Thank you. Hi guys, i have been using ur product from over a month now, its very good in use. And there is always an scope of improvement, so here are some suggestions i would like to make. 1). If possible please add arm pits zippers in your jacket, like those in the mountain wind jackets. This will function as a great ventilation while biking or as a general wear in hot or humid condition, as the breathability of the fabric is very low. 2). This jacket is uniformly dense and soft, and requires to be look in to it as, with most of ur pockets in use, it becomes little unpleasant in fit and carry, how ever if u will add some padded weights near chest, shoulders, back near shoulders and tummy pockets, the jacket will give pleasant fit and will be more tactical in terms of design and fit. I really liked ur product and totally understand that, its easy to give suggestion than to make a product itself. But all i want is to contribute in ur product and, u might already have thought of the points i have made, so if its helpful and possible please consider these inputs, else u already have a good product. Kudos.! Got the product today..Nice jacket..Fits to perfection..But difficult to wear in summer months..One thing I didn't know....Is it water resistant? Can wear in rainy season? Hi. Could you please let me know the status of order 60gp-kqph-vd78. Hi @Saneen my order id is 6eg8-ij8q-e3yy . Can you please tell me when my product will be shipped? @Nitin Kafle, This is Pre-Order, You have booked the Jacket today and We would need atleast 4-5 days to ship your Jacket, You will be notified. thank you for Pre-Ordering your VERSATYL Jacket. @Ayush Jain, Ankit Gambhir, Your Jackets are scheduled for dispatch today. You will be notified. Thank you. Kindly update the status for Tx id : 279c-529u-cq4x. Thanks in adv. Kindly update the status with Transaction ID: pzbj-800-2z9p and aeyg-y1g-5pst. @Saket Agarwal, Your Jacket will be shipped within a week. Thank you. My Transaction ID is 0r62-l34a-iqby kindly update on the Status. @Thejesh MS, Your Jacket was dispatched on 22nd. You will soon receive the tracking details. Thank you. @Pritam Chatterjee, Your Jacket was shipped yesterday. Tracking details has been mailed to you. Thank you. @Ayush, We received your Order yesterday. It will take us at least 3-4 days for us to ship your Jacket. You will be notified. thank you. @Ashish it cannot happen. It is a patch pocket at the right side on top of the second zipper pocket. I will mail you the picture of it in sometime. It should be in your jacket. Thank you. Headphone/ USB pocket is missing in my jacket!! 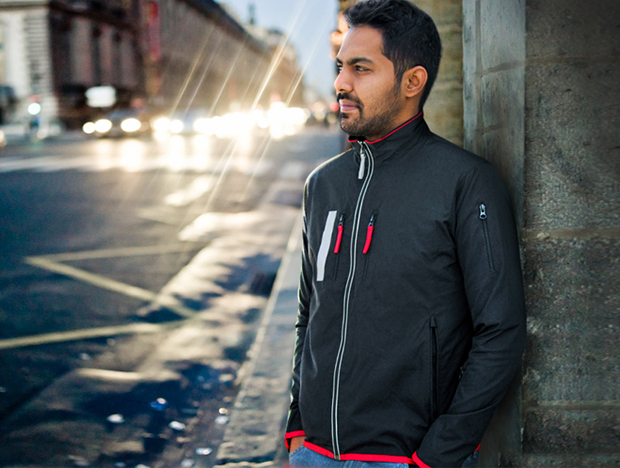 @Prasanna, Kindly mail us the preferred sizes and colors of the 3 Jackets you have ordered. emiratefashions@gmail.com and cc to admin@versatylwear.com. Thank you. How do I provide the jacket specifics for transaction ID (n4y8-cpuh-3vb9)? @Pritam, your customised Jacket came out of the machine last evening. Today it will be picked up the the courier service. will keep you posted. Thank you. @Umesh, Request you to kindly send us a mail to emiratefashions@gmail.com, admin@versatylwear.com. Thank you. Although jacket quality is amazing but there is one improvement needs to be done .i.e. the glove isn't stretchable & one can barely wear it as its pretty small...idk if its with all the jackets or only with the one i recieved.? @Ankit Gambhir, This is Pre-Order. Jackets will be shipped at least after a week from the date of booking. You will be soon notified on shipping. Thank you. Where should I track my order? Transaction ID: pzbj-800-2z9p and aeyg-y1g-5pst. No communication received regarding shipment. @Ashish Dullar, Kindly check your mailbox now. The package is in transit, in guwahati now. hey, sorry to bother you again but I didn't receive tracking details in my mail as I was supposed to by EOD yesterday. @Kiran Kumar N, Tracking details has been mailed to you. Thank you. @Chirag Mascarenhas, Apologies to our Funders for not giving an update. However shipping and deliveries are going on everyday and your Jacket is scheduled for dispatch tomorrow. You will be notified. Thank you. @Sudheesh, I have mailed you. Kindly revert back to me on that. Thank you. Hi there, my Tx ID: v5kx-ppt3-ei5p Please let me know the status, it's been a month since I pre-booked. Thank you. Please let me know the status of my order w708-275j-i09d No email or message regarding shipping or anything. How can you gain customer trust like this?? I have prebooked on Feb 28th and corresponding transaction Id is 12rq-r4b4-461b. Can you let me know if its shipped or how to track it. I am out of city of the delivery location. I need my friend to be contacted to collect the shipping. How do I arrange that now? @Ashish Dullar, Your two Jackets were shipped out yesterday. Tracking details will be mailed to you by EOD today. Thank you. @Saurabh Tolia, Will do the needful. Not to worry. Thank you. @Hemanth Mothkuri, Your Jacket is schedule for dispatch tomorrow. Thank you. @Vedprakash Jnaneswar, Sudheesh Sukumaran. Your Jackets are scheduled for dispatch tomorrow. Thank you. Wanted to check the status of 9k3m-5qaq-6cod. Will appreciate an update. @Manjunath, Hope It's delivered now. This is what present status is showing now. Thank you. @Pritam Chatterjee, Since there is some customization in your Jacket size, It's taking time. However it is into stitching today. Will dispatch in 2 days. Thank you. @MANJUNATH K P. Tracking details has been mailed to you. Thank you. @Shashikanth, Your Jacket has been shipped, You will receive notifications soon. Thank you. @Harpreet, We are taking Pre Order and this is crowd funding platform. I believe you didn't go through our delivery schedule on our campaign page before placing the order. You need to wait for atleast a week for your Jacket to be shipped. You will be notified on shipping soon. Thank you. Hello, I have not received any shipment details, it's been 24 hours I have placed my order. My transaction ID is y9i7-ju54-97uv Please, provide me with an update. Thanks. @Thejesh MS, Not to worry, I have already made the changes in our database. Thank you for Pre-Ordering your VERSATYL Jacket. @Ashish Dullar, We can see that you have booked 2 Jackets. Your Jackets are scheduled for Dispatched on Wednesday. You will be notified. Thank you. Hi, I have just now placed order for the jacket (transaction ID is np55-5q34-gqzl). After placing order came to know that there is a typo in my shipping address. I have to change house number to 68. Currently it is showing as 28. Please let me know how change the address? can you please update me with status on my order? Transaction ID: iou6-0c10-bhaa and 7053-80i-tqaq. @Swapnil Bhavsar, Noted. Will keep you posted. Thank you. Any status on order (Transaction ID: 097l-0mt9-cozt)? Please send it by Indian Postal / Bluedart / DTDC. Please do not send it by First Flight Courier. They don't deliver to my area (431112). @Sriharsha M, There are many who have received the Jackets that is why we do not see much comments here compared to our previous campaign. We have shipped out more than 300 Jackets so far. Not to worry. We are on track as per our delivery schedule mentioned on our Campaign page. Thank you. Has anyone actually received the jacket? Everyone seems to be asking for the status of their dispatch. Can someone who has received confirm it? @Elyasin Bhat, Your Jacket is scheduled for dispatch today. You will be notified on shipping. Thank you. Can I have an update on the status of my order? ID: 10l-p799-tur5 If it has been shipped could you send me the tracking details? @Jose George Konikkara, Shipping and deliveries are going on. Your Jacket will be shipped in a week. Thank you. @Tripurendra Kowshik Yedida, Tracking details have been mailed to you. thank you. HI i had ordered 3 jackets on 10th Feb 2017, my order id is 3s34-n22-51n2, Any update when i will get it? @Saneen Javali, what is the status of my order? @Anup, Noted. Thank you for Pre-Ordering your VERSATYL Jacket.. I would like to update my preferred size as L. The Transaction Id is o2pt-ct3-oe88. Have also dropped a mail to emiratefashions@gmail.com & admin@versatylwear.com regarding the same. Please do the needful. Thank you. @Rajesh NM, Your Jacket was dispatched on 8th. You should be receiving it today or tomorrow. Thank you. @Yashwanth Kumar, Yes, Your Jacket is scheduled for dispatch today. You should be receiving it in couple of days .Thank you. profile Saneen JavaliPosted 6 days ago @Shashikanth R, Yashwanth, Your Jackets will be shipped within a week. You will be notified on shipping. Thank you. - Could you please update. It's been a week now..
@Srijit Sreekumar, Your Jackets are scheduled for dispatch tomorrow. You will be notified on shipping. Thank you. Hi, I had ordered 2 jackets. Is it possible to know status of that order? @Shashikanth, Your Jacket will be shipped in couple of days as production of Red colored Jackets is ON. Thank you. @Sandip, Hope you have received the Tracking details on your mail. Your Jacket is in Transit. Thank you. @Saneen Javali, Thank you for the update. Appreciate it. @MANJUNATH K P, We have clearly mentioned on our Campaign page that We will ship the Jackets within 30 days from the date campaign ends. However we have started the shipping early and many of the early funders have already received their Jacket. Your Jacket will be shipped in a week. Thank you. Hi , Can you please update the status of my order. Its been a month and have not received any update other the transaction id. Are you really sending it? @Tripurendra Kowshik Yedida, Himalya Mathur, Swapnil Bhavsar. Your Jackets will be shipped in a week as Grey colored Jackets has just gone into production. Thank you. Hi, Can you update the status of my order? Hi, can you please update me about my order status? Can you update the status of my order? @Jerin, Request you to kindly check your mailbox. We have sent you the tracking details. Thank you. @Pritam, I have replied to your mail. Thank you. Hi I have purchased 3xl size after consulting Mr John from your side. My chest size is 50. 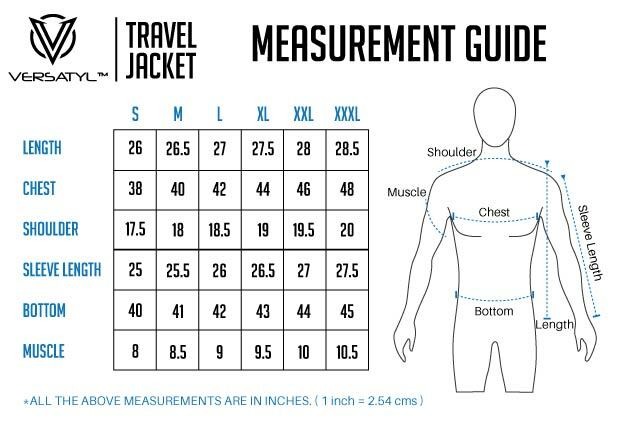 According to your size chart it will be 4xl.. Kindly make necessary arrangements for my fit..
@Animesh, Thank you for the feedback. We are happy that you liked our product. Well you just need to remove the inbuilt small bag from the carry all pocket at the back and start stuffing the jacket. The fabric is bit wrinkle free so not to worry. You can check this video for better understanding. https://youtu.be/Xfvh6O19mGU. Also you can reach me at emiratefashions@gmail.com and admin@versatylwear.com for any suggestions or queries. Thank you once again. I also have a few suggestions to further improve the design of the jacket. Please let me know where can I send my suggestions. Received my Versatyl Jacket today.. Very happy with the material as well as the build quality.. Congratulations to Team Versatyl.. However I am having slight difficulty using the feature of putting the jacket into the built-in pouch at the back. Does the jacket need to be folded in a specific manner? Otherwise you need to struggle to get the jacket into the pouch. Can you please post instructions or possibly a video showing the correct way it is meant to be used? @Yashwanth Kumar, You have opted for S, Ebony Black. @Shashikanth R, Yashwanth, Your Jackets will be shipped within a week. You will be notified on shipping. Thank you. @Jerin, Your Jacket is being dispatched today. You will be notified on shipping. Thank you. @Saneen Javali. Could you please update on my order shipping status. Also which size i had booked ?? @Soumyadeep Ghosh, Your Jacket has been dispatched today. You have opted for XXL, Black/Electric blue. Thank you. @Kaushik, Your Jacket has been dispatched yesterday. You will be notified with the Tracking details soon. Thank you. Sir can i know when will I get my Jacket ?? 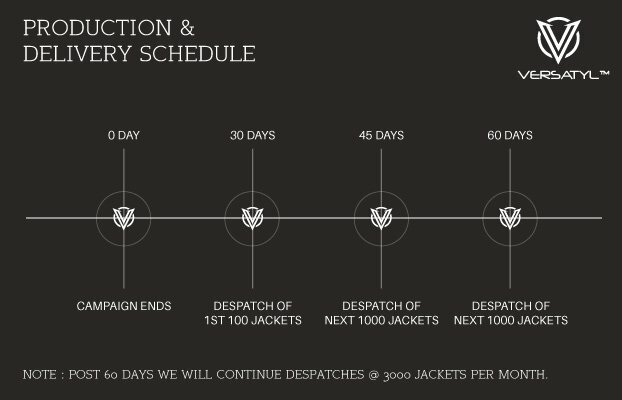 @Umesh, If you check our dispatch schedule on our campaign page, it says we will dispatch Jackets within 30 days from the day campaign ends. But Good news is that Shipping has already started and more than 75 Jackets has been shipped past 2 days. Your Jacket is scheduled for Dispatch tomorrow. You will be notified soon. Thank you. @Alessandro, Not to worry. You do not have to pay any difference amount as you have pre-ordered via backerland where you get extra 20% OFF. Thank you for Pre ordering your VERSATYL Jacket. @Prashant, yes you can, kindly send us an email at emiratefashions@gmail.com and admin@versatylwear.com. Thank you. Can I change the jacket size after funding the campaign? @Shashikanth , I suggest XXL. If yes, then I will update it in my database. Thank you. @Shashikanth, Yes we advice our funders to go for an extra size as the Jacket is meant to carry the essentials. Your request for size change has been noted down. Thank you. Dear Saneen Javali, My order transaction ID is f6zh-z8n7-l57e, i ordered for XL, Please Make It as XXl. kindly do the needful. @Soumyadeep, The shipping will start after the campaign ends on 4th of April. Thank you for pre ordering your VERSATYL Jacket. I contributed under "Super Early Bird (India)", can you please confirm by when it will be shipped & estimated delivery time. @Rajasekhara, The Shipping starts once the campaign ends. You will be notified. Thank you for pre-ordering your VERSATYL Jacket. @Florence, Yes Campaign ends on 4th of April and Your Jacket will be shipped before 25th of April. Thank you for Pre-Ordering your VERSATYL Jacket. Do spread the word on VERSATYL. Since the campaign ends in April, will this jacket ship to the USA by the estimated April 2017 date? Thanks in advance! @Kiran Kumar, the Jacket is same which is offered in both the early birds, only difference is the price and delivery time. It's like You book early and get the Jacket early at lesser price. Thank you. @Kaushik Senguttuvan, Since this is crowdfunding, the Shipping of Jackets will start once the Campaign ends and yes ofcourse you will be notified. Thank you. Any details of difference between Early Bird and Super Early bird? I have placed the order under super early bird two days ago. Will someone contact me about the delivery, Can I atleast know the expected delivery time?? @Yashwant, My staff will get in touch with you morning. Thank you for pre ordering your VERSATYL Jacket. @Vijaya Shree, You can mail us the address to emiratefashions@gmail.com, admin@versatylwear.com. With regards to the delivery schedule, request you to browse through our campaign page where you can find the complete info about delivery schedule. Thank you for Pre-Ordering your VERSATYL Jacket. @Karthik, Your Size change request has been noted down. Well yes this is a Unisex Jacket so kindly refer the specs chart on the page and choose accordingly. Thank you. Hi, I've already placed order and I want to change my size from M to L. I just got to read Pre-Order TIP. If possible please put that under size selection drop down to help other buyers. Transaction ID is 4nr4-7706-89aq Also I'm planning to order 1 more but is this Unisex or how can I choose option as Women ? 105 Versatyl Jackets booked by CISCO !